I have been interested by Jeremy Love's Bayou webcomic series since I first heard about it (which, admittedly, wasn't too long ago). I decided it would be a great fit for me to read during A More Diverse Universe because it is just the sort of fantasy I want to read. Not only is it a beautifully illustrated graphic novel, but it has a really brave young girl at its heart and addresses the very important issue of racism, particularly the myriad ways in which it can effect a society, in a highly original and truly terrifying way. Lee lives on the Mississippi bayou with her father in the early 1930s. Her best friend is Lily, a white girl who can sometimes be nice and can sometimes be horrible. One day, Lee sees Lily eaten by a monster from the swamp. When she gets home, she realizes that her beloved father has been accused of kidnapping her best friend. After a brutal beating, he's hauled off to prison, though everyone thinks he's likely to be lynched before he even stands trial. 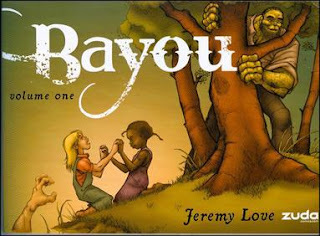 Lee decides that she must save her father, and sets off to the land of the monster to do so, embarking on an Alice in Wonderland type adventure steeped in Southern folklore and tradition, accompanied by a kind and haunted giant name Bayou who dreams of losing his children to shackles that rise up from the ground. It is difficult to review these two volumes because the story is unfinished, frustratingly so. I remember feeling similarly when I got to the end of Castle Waiting and realized that there were many loose ends that I'll likely never see wrap up. But Castle Waiting is a light and fun read, whereas Bayou does a LOT of heavy lifting. I ended Volume 2 still not knowing if Lee will save her father from lynching, and there were so many other questions left unanswered, too. But if you go into this series with a willingness to embrace that ambiguity, then you'll be highly rewarded. 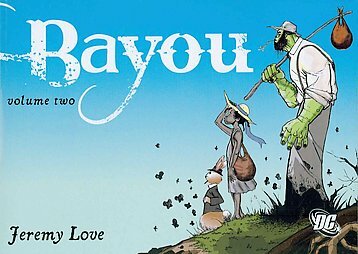 Bayou is one of those books that convinces readers that the comic format is a powerful force in literature that should be taken seriously by all readers. It explodes with meaning on every page. It's a coming-of-age story for a young girl. 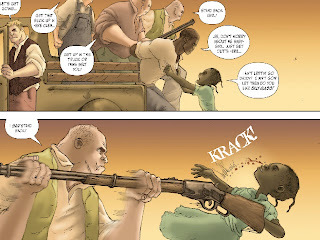 It's a tale of loyalty and friendship that transcends the traditional boundaries - of a black girl trying to save her white friend, and of a strong man beaten into submission learning about courage from a tiny girl. It's about broken families and how poverty can impact social structure. It's about how slavery's legacy carries on for generations so that poor, uneducated little men can feel big and powerful by using cruelty against others. It's about the power of music, the ill effects of alcohol, friends betraying friends for money, and so much more. (There is even a very disturbing bit on natural African hair being "nappy" and the straightened, chemically treated hair being much better.) And it's all told in such lush, beautiful pictures. I admit that there were parts of this story I didn't get, connections I couldn't draw. Many characters have ties that began before the story does and lives that extend from our world to the fantasy world and back again. There are crows - called Jim Crows - that can tear a man apart. There are bloodhounds that keep everyone submissive. There are rabbits - and I admit I don't know the significance of these characters being rabbits, but I'm positive there's a reason. There's really so much here and so much more to come. The story is on so many levels that I'm positive I'm missing a few of them. And the drawings are so evocative. This is one of the best graphic novels I've ever come across - there is so much depth in the story, so much heart in its characters, so much horror in the situations they face, and so much that is true about their relationships. There's nothing obvious in the story - the characters have feet of clay, and as a reader, I was so worried about little Lee and the people in whom she was forced to put her trust. But Lee has seen and dealt with more in her ten years than I am likely to see in my lifetime, and if there's anyone who can tackle the problems that arise, it's her. 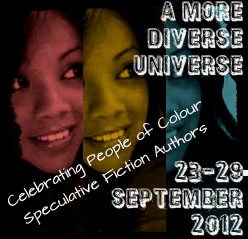 This review is posted as part of the A More Diverse Universe Reading Tour. I'm SO glad you loved these books! I did, too--they're so beautiful and fantastical and frightening. In retrospect, I remember them as being a horror story with a lot of strong, beautiful parts--the evil is just so powerful and pervasive and terrifying that I think it's what stuck with me. Also, I don't know when the next collected volume will come out, but if you're dying for more, the individual issues are available online (ie. to read on your computer) at comixology.com for $0.99 each. Everything I've read says that the first two collections are each four chapters, meaning 9 should be the next one, but looking at the blurb I swear I've read 9, so I'm not sure where it leaves off. Anyway, in case anyone is that impatient! You are so right- the evil in these books is so pervasive and horrifying. Really shows you just how racism can seep into everything. I've only read the first first volume, but I loved it. I really need to get volume two. I just loved how Love took all of the racist ideas and characters and incorporated them into the story (Jim Crow, the Golliwog, etc. etc.)... it was just so clever. Glad to see another positive review!! I completely agree - it was highly inventive and I really appreciated the depths he took it to. These illustrations are so lush and colorful, and from the way you've described the story, it really does sound empowering and also dark. I would love to read these two books, and though it might make me frustrated that the series goes into standstill after they are over, I am sure that I would be highly entertained by them. I am also sure that they would make a tremendous impact. I am listing them in my wish list, and will see when I can get to them. They sound amazing! I found them pretty easily at Barnes & Noble - you can read them online, too, if you want. I bet the color will be even better! I just read volume one, and I didn't get a lot of it either, but the drawings were so wonderful and magical, I just loved it anyway! Ha, EXACTLY! So much over my head, but what I did catch was great. Sounds really good. I like webcomics, so I'll have to check the site out. It looks like great art, which is always important to me in a graphic novel. I read volume 1 a while ago and wanted to love it, but I just didn't get it. I mean, I got the main points, but the whole feeling, the magical intermingling with the real left me off-kilter. I can completely understand that. It was difficult for me on many levels, but I really enjoyed the way that people crossed over the worlds. Is it just because I'm impatient, or has it been...kind of a while since there's been any new Bayou? I love Bayou and I want there to be more because I want to know where the story is going. It's so beautiful and weird and cool. What a great idea for A More Diverse Universe post! I love these books and, like Jenny, can not wait for a third volume. I like the blending of fiction and reality in the way you describe. If there's so much unfinished does that mean he's still writing/drawing them or were they purposefully left so? Wow, I've never heard of these, but they look beautiful. I'm always looking for interesting graphic novels, there are so many to choose from! 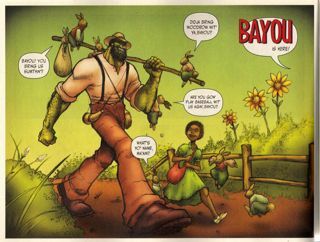 I'd not heard of Bayou before you and Vasilly mentioning it on Twitter. Thanks for this review, I'll definitely have a look at it. Hope a third book will be released soon! I love this series! I'm so glad you enjoyed it. Some of the characters are from old Southern folktales like Brier Rabbit. While I was reading the series the first time around, I had to look up some of the references. Now I want to re-read the series. Oh, I wanted to read these before, but now I really do. Sounds like they would make for great co-reading, with so many layers to them!